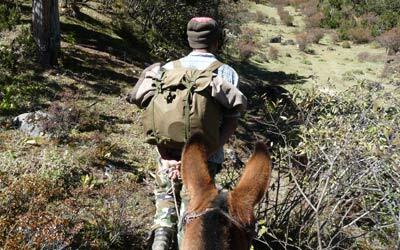 What could you expect during a day while trekking in Bhutan? 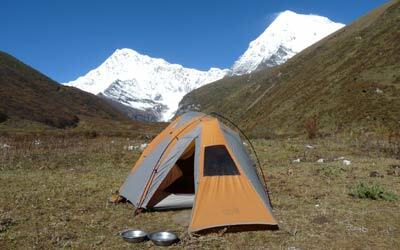 Here’s a small idea of ​​what could await you when you go hiking in the mountains of the Himalayas! 6:30 – Alarm clock: The assistant chef brings us a cup of tea to encourage us to get up! We are then entitled to a small bowl of hot water for a quick wash in the tent as it is still cold outside (acrobatics guaranteed!). 7:30 am – Breakfast: Our bags have been packed and we head for breakfast. Every day the menu changes: omelets, toast, jam, butter, peanut butter, cocktail sausages, cereals, porridge, tea, fruit juice, and even pancakes to provide a morale boost to the troops! 8am – Departure: We leave the camp quietly behind us along with the mules as we trot to start the day. After a few hours of walking (around 11am), the team is far ahead of us. 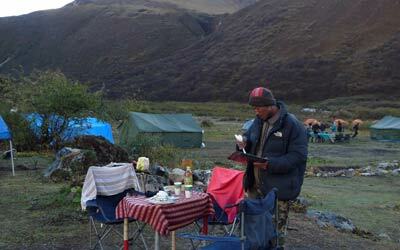 The cook, ten mules and assistants had got a head start much in advance to set up our tents at the next stop. Before settling in for lunch we get some delicious juice, which tastes divine after all that walking. 12:30 – Lunch: The assistant comes with our lunchboxes. The meal consists of rice with vegetables, meat (chicken, pork, beef or fish), another vegetable dish with gravy, fruits, tea and fruit juice. 13h – Here we go again: We leave shortly after lunch (so that we’re not tempted to nap) and continue to the camp. Depending upon the stamina and rhythm of walker, we can arrive between 14h and 16h30 at the next camp, hopefully before it gets dark. 16:30 – Teatime! A good cup of tea with biscuits appeases our appetites as we wait for dinner. We take this opportunity to review the day and remember our best moments. You can test the pepper cooked popcorn if you’re adventurous enough! A new bowl of hot water is available to freshen up after a long day of walking. 18h30 – Dinner is served under the tents around a small table. We find a similar menu for lunch, with the addition of heartwarming soup as a starter and fruit for dessert. Fatigue catches up with us, as the time to sleep arrives (with a little hot water bottle to warm your feet). Each of these days will be punctuated with unique experiences, such as a neck passage, crossing a river, and meeting nomads, yaks and mules!